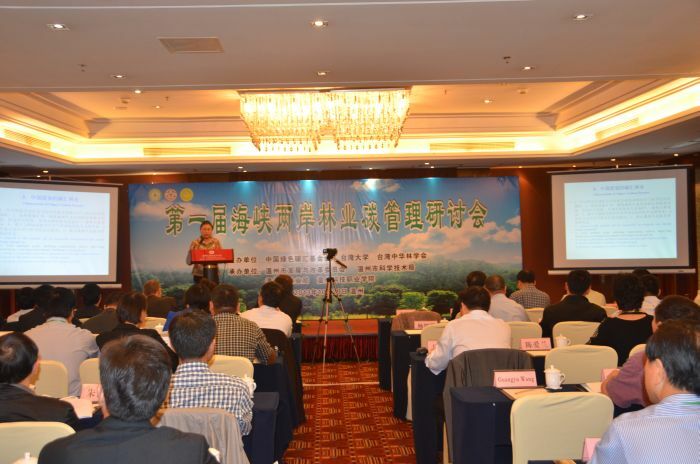 The 1st Cross-strait Workshop on Forestry Carbon Management, an event jointly hosted by the China Green Carbon Foundation, National Taiwan University, and Taiwan-based Chinese Forestry Association, was held on October 29 in Wenzhou. Leaders as represented by Mr. Liu Yuhe, President of the Board of Directors of China Green Carbon Foundation and former Vice Minister of Forestry Ministry of China, Mr. Ren Yuming, Deputy Mayor of the People’s Government of Wenzhou Municipality, and Mr. Liang Zhiwen, Secretary-General of Taiwan-based Chinese Forestry Association, delivered addresses in the Opening Ceremony of the workshop. More than 70 representatives from Universities, scientific research institutions, and organizations responsible for the management, implementation of forestry carbon sink programs, as well as carbon trading agencies at both sides of the Cross-Strait attended the workshop. Forest, due to its unique carbon sink capacity, has played a special role in combating climate changes. Propelled by the ever-enhancing international endeavors in tackling climate changes, forestry carbon management is a newly evolved field worth of study and promotion. In the workshop, experts from the State Forestry Administration, National Center for Climate Change Strategy and International Cooperation, China Green Carbon Foundation, China Standards Research Institute, Zhejiang A&F University, Wenzhou City Forestry Bureau successively introduced the development history of forestry carbon management, national strategies in combating climate changes, methodology research on forestry carbon sink programs, study on the carbon sequestration function of bamboo forest and the implementation of forestry carbon sink programs, which as a whole have laid down a solid theoretical and practical foundation for the introduction of forestry carbon sink into the national carbon trading system. Taiwan-based higher education and forestry research institutions have conducted a series of innovative fundamental researches on forestry carbon sink based on Taiwan’s actual conditions. Meanwhile, they have applied research achievements widely to production practices to satisfy both the education and manufacturing needs, thus accumulating a great deal of first-hand materials of high value. Also in the workshop, special reports delivered by researchers from National Taiwan University, Taiwan-based Chinese Forestry Association, National Taiwan Normal University, Aletheia University, and Taiwan Forestry Research Institute thoroughly explored a wide range of topics like Taiwan’s strategies on forestry carbon management, the quantity of man-made forest and the resulting carbon sequestration, community forestry as well as carbon sink enhancement and emission reduction programs, plat ground afforestation plan and carbon trading mechanism, the influence brought by afforestation and eco-restoration in mountainous areas on the quantity of forest and carbon sequestration, carbon flux observation on institutional forest conducted by National Taiwan University, incentive system on afforestation efforts, efficiency analysis over carbon sequestration, etc. Delivered by cross-strait leading figures engaged in research and implementation of forestry carbon management and stipulation of policies in combating climate changes, such speeches and reports have won wide recognition from attendees of the workshop in virtue of their updated and complete contents of high standards. Besides, these speeches and reports actively explored the current hotspot and tough issues in forestry carbon management from multiple angles and dimensions, and provided attendees with rich contents ranging from review and analysis over policies in combating climate changes, theoretical discussion of forestry carbon management and summary of accumulated experience, introduction of endeavors on stipulating local rules over carbon sink calculation and supervision in line with international rules, and to introduction to progress of forestry carbon sink programs as well as achievements in observation and calculation of carbon sink changes to forests and woods. Attendees of the workshop hoped that, with enhanced cooperation, hosts of the great event could make it into a civil and open platform for the exchange and cooperation of forestry carbon management across the strait, so as to make cross-strait exchanges a regular and common activity and solidify the improvement of overall cross-strait research capability in this sector. The attendees also expressed their expectations that multi-parties should promote the application of theoretical research achievements of forestry carbon management into practices, thus making more contributions to helping combat climate changes and protect our shared earth.